The highlands of central-eastern Sardinia known as the Supramonte comprise one of the largest karst areas on the island: sharp limestone cliffs, lush canyons, mysterious caves and underground rivers. It is 35,000 hectares (135 square miles) of terrain, much of which is uninhabited and barely explored. Active scientific exploration of the caves started in the 1950s, and they have become a boon to scientists, sport spelunkers, and now, interestingly, the ESA, the European Space Agency, which uses some of them as a training site for astronauts. The 2012 summer training session for a group of ESA astronauts has just concluded. It was called CAVES (get it?) (Cooperative Adventure for Valuing and Exercising human behaviour and performance Skills). This year, the CAVES training included astronauts from all of the International Space Station partners: NASA's Mike Fincke and Drew Feustel from USA, David Saint-Jacques from the Canadian Space Agency, Roscosmos' Nikolai Tikhonov from Russia, JAXA's Soichi from Japan and ESA's Andreas Mogensen from Denmark. They spent a week in the Sa Grutta caves in Gairo Taquisara, part of the town of Gairo, spread from 650-800 meter above sea-level over the Pardu river valley in the province of Ogliastru. The nearest train station is Ussassai. At the 108 km mark of the railway route just before Gairo, you find the Cabu de Abbu caves that are of interest to the European Space Agency, specifically, the Sa Grutta de su Coloru. 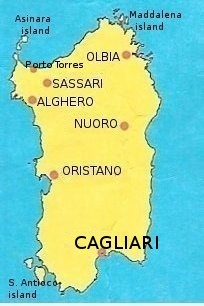 (On the insert map, above, the site is south of Nuoro, a bit to the right of where the final letter "o" is in the name "Oristano." While not immediately obvious, there are elements of cave dwelling that mimic spaceflight and can serve as training for the real thing. Hans Bolender, Head of the European Astronaut training division explains: "There are many similarities to spaceflight such as a lack of day-night cycle, sensory deprivation, minimal hygiene and the necessity to work as a team and solve problems together." The CAVES program focuses on human behaviour, helping astronauts improve their teamwork and leadership skills, working safely and effectively in unusual environments and solving problems as a multicultural team. The San Giovanni grotto is in SW Sardinia in Domusnovas, a hill-town of 7,000 inhabitants in the Sardinian region of Carbonia-Iglesias, 40 km 25 mi NW of Cagliari. The grotto is remarkable in that it is an 850-meter karst cave, totally paved with asphalt. You used to able to drive through it! You didn't have to learn how to spelunk, rappel on a double-rope harness, or any of that stuff. You just buckled up and put the pedal to the stalactites. This sin against nature (or marvel of engineering) was built in the 19th century in order to facilitate the transport of material from the nearby Sa Duchessa mine. There are two other "cave roads" like it in the world: one is the Grotte du Mas-d’Azil in the French Pyrenees and the other is the Grand Arch of the Jenolan Caves in Oberon, Australia. I said "used to be able to" because, alas, the Environmental Protection Agency of the semi-autonomous region of Sardinia (kill-joys that they are!) declared it a national monument and put it off-limits to motorized traffic. You may, however, still walk through. It's well illuminated. It's a great find for cavers on foot because there are side branches that shoot off further back into the rock where there be dragons and such. Even small, hidden lakes. Just in case, bring along that double-rope rappeling harness.